Have you tried Acehnese cuisine? Aceh is a special region located at the northern end of Sumatra, which also denotes the westernmost province of Indonesia. Culinary-wise, Aceh is highly influenced by peranakan Malay / Arab / Indian cuisine, which translated into lots of herb & spices usage in cooking and it's mostly curry heavy like other Sumatra regions e.g. Padang. Few samples of Aceh cuisine that I could think of: Ayam Tangkap, Sambal Ganja, Mie Kepiting Aceh, Kuah Pli'u, Timphan, etc. NOW, SPEAKING OF... AYAM TANGKAP. 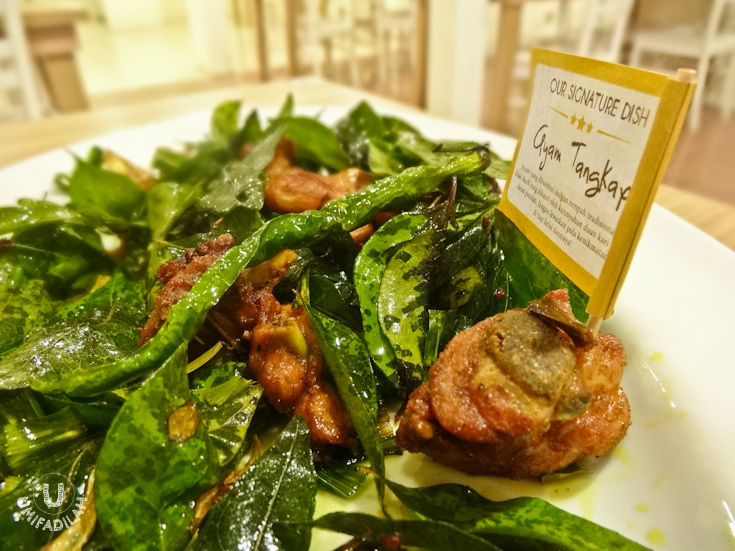 Ayam Tangkap, literally means "caught chicken" in English (now imagine someone running around the yard to catch chicken for the day's meal...), is basically an aromatic fried chicken dish covered with assorted crispy fried leaves and green chili. Different from the rest of Acehnese cuisine which are super spicy & coconut-milk heavy, Ayam Tangkap is categorized as a simple but flavorful dish that could just lure everyone that is new to this type of cuisine. Small chunks of chicken are marinated with salt, ginger, crushed candlenuts, garlic and other spices before frying. 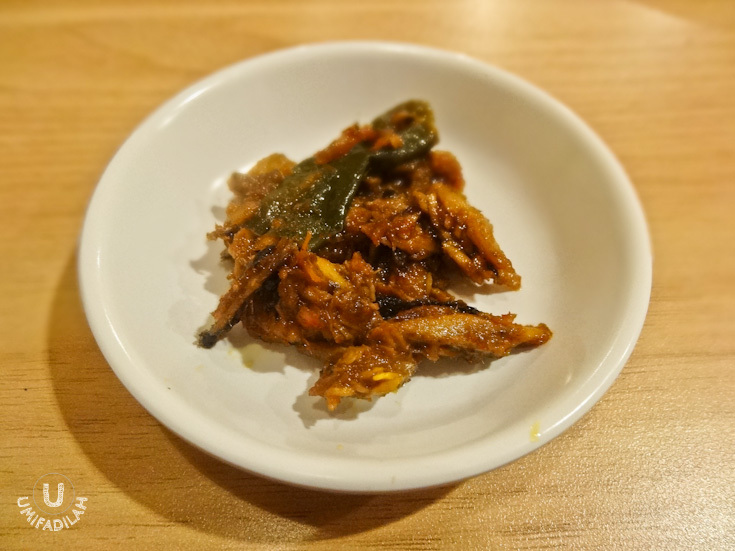 And then, the addition of shallots, green chili, curry leaves, Pandan (screwpine) leaves cut into small pieces, and local leaf called 'Temurui' (daun salam koja) upon frying gives a herbal infusion to the fried chicken, which explains the pungent aromatic scent that's simply uh-ma-zing! This dish is also called Ayam Sampah, literally "garbage chicken", or Ayam Tsunami, because of its messy presentation with fried leaves being spread perfunctorily on the plate. 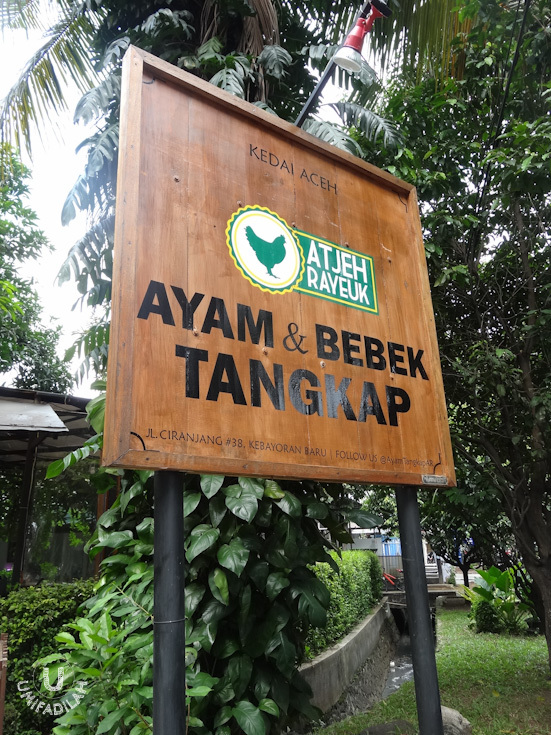 Now, there is this quite new restaurant near Senopati area that's specialized in Ayam Tangkap. Named Ayam Tangkap Atjeh Rayeuk, in which Rayeuk in Aceh language means "big" (besar, in Bahasa Indonesia), so it literally means Ayam Tangkap from Aceh Besar. I heard about them first from Twitter (of course :), and decided to give it a try. This restaurant is managed by Chef @PokijanAcil (Astrid Enricka) and several others, as seen on their offical Twitter bio, @AyamTangkapAR. Small but homey place with an open terrace concept. At Ayam Tangkap Atjeh Rayeuk: 1 portion of Ayam Tangkap with Steamed Rice and Sayur Ubi Tumbuk (pounded cassava leaves in light coconut milk broth) will cost you around IDR 35.000. This might sound biased as I'm more of a duck-meat fan, but honestly the winning dish for me in Ayam Tangkap Atjeh Rayeuk is their Bebek Tangkap instead. The same cooking technique, but they use duck instead, with duck gravy and sambal made of mango slices and chili. It's either my taste buds have been blinded by the WOW ZOMFG duck gravy, or their Ayam Tangkap needs a little more kick in terms of flavor. Also, I kinda miss the fried green chili in both Ayam/Bebek Tangkap as in here they use some bright red chili which seemed more of a garnish (because it's still crunchy, not soft). Bebek Tangkap (IDR 40.000). If they serve Ayam Tangkap with a hearty bowl of pounded cassava leaves, Bebek Tangkap, on the other hand, is accompanied by the OMFG delicious duck gravy and sambal with fresh slices of sour mango. WINNING DISH! Next is the sambal selection. You can't eat Acehnese dish without sambal. The most popular one is Sambal Ganja (literally means Weed Sambal), which is usually made of pounded boiled shrimp with lemon grass, shallots and belimbing wuluh (cucumber tree in English). Yep, no real weeds involved so it's safe to say that it's legally delicious and addicting. But here I found out that their Sambal Ganja somewhat looks a bit 'mushy', it's as if they came out of blender, not the traditional mortar & pestle. Also, for me the sourness that came from the 'belimbing wuluh' is just way too overpowering. I hope I was just having a bad day that time. Because in the end they redeemed themselves with their Sambal Kecombrang (honje) or Sambal Kincung, which was very refreshing! But for me, the highlight was still the Sambal Mangga (chili sambal with sliced fresh mango on top) that accompanied Bebek Tangkap. Mie Aceh Daging. If you're into spicy food, then you should try this one. I must say, what we had that day was SUPER hot it made us went "uuuhhh.." "aaaah" after just one bite. I don't know if it's usually that hot, or my tolerance to spicy food has just gone worst from time to time. If they have the option to adjust its spiciness level then that would be more awesome! Rujak Serut Aceh. Here comes the dessert. What I love about Acehnese cuisine is that, even their desserts are refreshing & really awakens your taste buds. And the one that I had in Atjeh Rayeuk was superb. Perfect balance between the mixed fruits, the dressing, and the addition of peeled ground nuts works really well together. I just wished it stays chilled in the refrigerator a bit longer. Es Timun. The iced cucumber beverage I know, uses Pandan syrup or sometimes Melon syrup to sweeten the drink. I'm not sure what they use in Atjeh Rayeuk, but for me it lacks sweetness (see that pale color?). Es Sirop Cincau. Served in a fancy jar-like glass, this looks really refreshing on a sunny day. Well-balanced sweetness vs the grass jelly amount. My overall experience in Ayam Tangkap Atjeh Rayeuk in Ciranjang 38 was quite good. Its strategic location which is only 5 minutes away from SCBD, one of Jakarta's biggest office complex, made it perfect for a short lunch getaway. And their Bebek Tangkap wins my heart. Opening hrs: Mon - Thu 11.00 - 21.00; Fri - Sat 12.00-22.00; closed on Sunday. When I was scrolling through their Twitter timeline *Stalking MODE: ON :p* I just found out that Ayam Tangkap Atjeh Rayeuk was originally located at Jl. Ahmad Dahlan no. 30, and had their opening since January 2013. But somehow they had to move to this new location and they got to keep the name, while the other one at the original building had to change the name & concept since mid February 2013. It's located adjacent to Warung Ampera at Kebayoran Baru branch. Not hard to find at all. Bright, minimalist decor, clean, and spacious. More suitable for friends/family gathering because of those particular reasons. True that Ayam Tangkap is their specialty, but they also serve Sup Ikan Khas Aceh (fish soup), Anyang Pepaya, Gulai Udang (prawn curry), Sie Reboh (Acehnese beef soup), Ikan Asam Keueng (something similar like Sumatra's Asam Padeh); and on several ocassions e.g. weekend they also serve Kuah Beulangong and Kuah Pli'u as well. The main difference of Ayam Tangkap Atjeh Rayeuk vs. Ayam Tangkap Blang Bintang is that, in Atjeh Rayeuk they sold their Ayam Tangkap in a single meal portion that already includes steamed rice & a bowl of pounded cassava leaves, while Blang Bintang, on the other hand, chooses to serve it ala carte which is just perfect for sharing up to 2-3 people. 1 ala-carte portion of Ayam Tangkap (IDR 38,000). The seasoned fried chicken was really good and tasty. I can munch on those crispy fried leaves as snack! The soft & tender fried green chili, yeay! Haha I'm a sucker for this one, really. The other highlight was their Sambal Ganja. 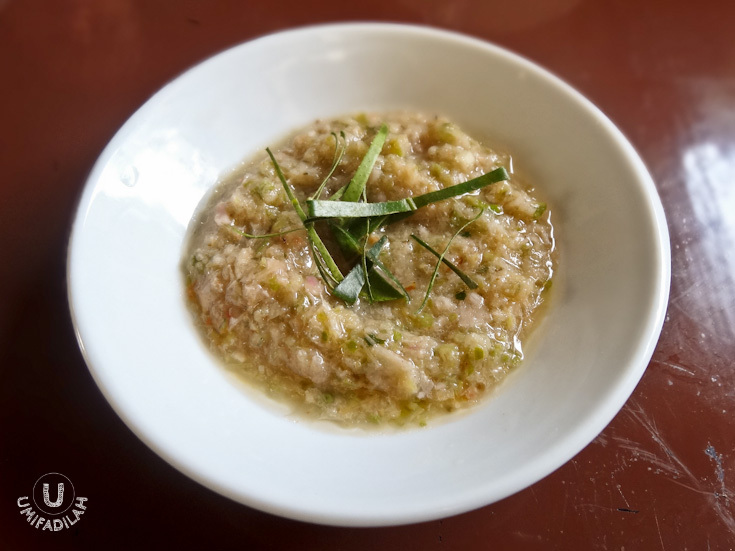 Just by the looks of it I can tell most of the ingredients: pounded shrimp, green chili, lemon grass, shallots, and of course Belimbing wuluh; mixed and pounded altogether giving that coarse look, and seasoned beatifully that everything just works the way I'd imagined. Love it. Also try their Sambal Keumamah, which is made of Ikan Kayu (some kind of Tuna that have gone through several smoking process - similar to Japanese Katsuobushi). Tasty! Sambal Keumamah (IDR 10k) - ordered half portion and thankfully they allowed it! :D These two are perfect complement to each other. The only dish that didn't quite win my heart that night. Mie Basah Daging (IDR 35.000). We thought we'd try a different version of Mie Aceh, the one with soupy noodle. But I found it a bit too sweet to my liking. Maybe next time I'll go with Mie Goreng Udang (fried Aceh noodle with prawns) instead. Es Timun/Iced Cucumber (IDR 12.000). They used melon syrup this time. Not too sweet, so it's refreshing enough. Like this one better! Ceuneucah/Rujak Serut Khas Aceh (IDR 8.000). Different from what Atjeh Rayeuk serves, this version of Rujak Serut Aceh is served on a glass & has more oozing liquid (with the addition of ice cubes). It also gives stronger sour kick but from what I saw that day, no ground nuts on top. Well it's a matter of taste, I guess, but I prefer AR's version. 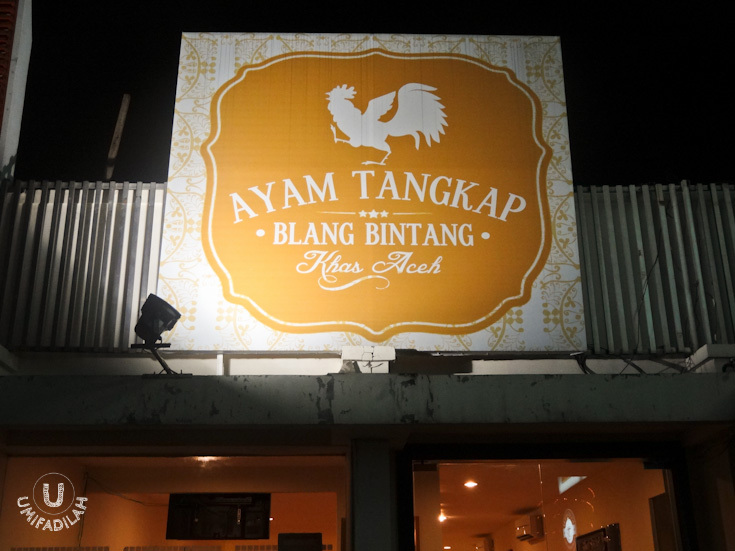 Overall it was a pleasant experience at Ayam Tangkap Blang Bintang. They also have more extensive menu selections so I will most likely come back to try other dishes with such intriguing names e.g. Kuah Pli'u and Sie Reboh. Their plateful Ayam Tangkap (with fried green chili :p) along with Sambal Ganja wins my heart. Both restaurants seemed to share the same vision to bring more hype of Acehnese cuisine to Jakarta, and maybe, it's actually a good thing that they split into two different concepts, after all. I mean, look at the bright side. Atjeh Rayeuk serves in one single portion meal concept - taking advantage of its strategic location near one of Jakarta's largest business district - and aim for weekday's short lunch getaway for office workers; while Blang Bintang could really take an advantage of its spacious venue to bring ala-carte concept and a more extensive menu selection which is more suitable for friends/family weekend gathering.